the newly-opened Voxman Music Building in downtown Iowa City. 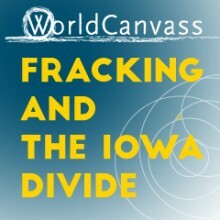 BEI Fellow Taylor Brorby will speak at the WorldCanvass event at the University of Iowa on September 13th at 7:30pm, in the newly-opened Voxman Music Building in downtown Iowa City. “Guests in our second segment, Mitch Brouse, Ion Vasi, and Taylor Brorby, will focus on controversies and opposition, especially the sometimes dramatic and adverse environmental and social impacts.